Two years ago, Florida State University senior Sandy Simmons went to a college housing conference and got a big idea: recycled bike rentals for students — on the cheap. "I thought this is really possible — why can't it be done at FSU?" said Simmons, who grew up in West Palm Beach. "Tallahassee has the right weather and terrain for bikes. It's perfect." Simmons, an honors student majoring in physics and astrophysics, with plans to pursue a graduate degree in public policy, has loads of ambition, particularly when it comes to environmental sustainability. His campus bike rental idea — aptly named reCycle — made its way this spring to the Florida Legislature. With the help of FSU's Kathleen Daly, assistant vice president for Governmental Relations, wording in a state statute was tweaked to allow bikes abandoned on Florida's public university campuses to be repaired — and ultimately rented. "I love all of my students, but for something like this to get done — it had to be Sandy," said Elizabeth Swiman, FSU's director of Campus Sustainability, who, along with a cadre of other mentors, helped Simmons shape his dream into reality. "The passion is there, but so is the willingness to learn the process." After listening to Simmons talk about his bike rental idea, Swiman encouraged him to seek advice from experts, such as Jeff Horton, program director of Commuter Services of North Florida. The FSU-based organization (funded by the Florida Department of Transportation) encourages carpooling, public transit, biking, walking, telecommuting, and flexible work scheduling — both for commuting workers and for students. "That's how I see my role," Swiman said. "Hooking students up with the right people, and saying, 'There, go, work with an expert.'" Now in its third semester, the reCycle idea is slowly taking root. The program initially relied on a few new bikes (purchased with money from FSU's Marketing Institute, a mobility and sustainability-focused program within the College of Business) and a handful of used ones repaired by Tallahassee's University Cycles. New crops of abandoned bikes are currently being repaired for the fall semester, bringing the number available for student rental to about 40. 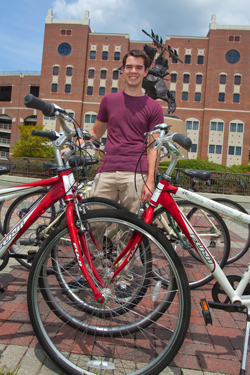 FSU students heading back to school can rent bikes for $25 a semester or $40 for the year. Bikes come with loaned helmets, locks and lights, said Simmons, who will staff the rental table, along with a team of volunteers, during the Involvement Fair beginning at 7 p.m. on Sunday, Aug. 28, on the Oglesby Union Green. The effort reduces the number of students driving to campus and provides a cost-saving service to students who may not be able to afford to purchase a bike. Though the program is still small, Simmons hopes hundreds of FSU students will someday pedal their way to class on recycled rental bikes. "We want to keep the number of bikes manageable at first," he said, "so that the program can continue to grow after I've graduated." For more information about bike rentals and campus sustainability at FSU, visit sustainablecampus.fsu.edu or www.facebook.com/FSUreCycle. "I love all of my students, but for something like this to get done — it had to be Sandy."